Warships from 6 international navies are currently operating as part of the French led Combined Task Force 150 (CTF 150), conducting maritime security cooperation in close coordination with coastal states and regional partners in the southern Red Sea, Bab el Mandeb strait and west of the Gulf of Aden. This operation is part of a series of several maritime security operations conducted in the region by the Combined Maritime Forces (CMF). The operation has been planned to establish a routine flow of information between CTF 150 assets and their regional partners and specifically the ships and Naval Operation Centres (NOCs), to be able to coordinate a wide response to any possible terrorist threat and the subsequent use of the maritime environment in this strategic area. 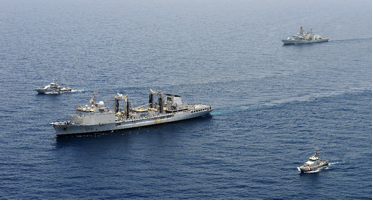 Common patrol with FS Somme, HMS Kent at the stern, the Yemen Coast Guard patrol boat in the foreground to the port of FS Somme and the Djibouti Navy patrol boat to the starboard of FS Somme. This cooperation will deter the illicit activities linked to terrorism and will enable CMF forces to maintain a safe maritime area for the legitimate mariners. 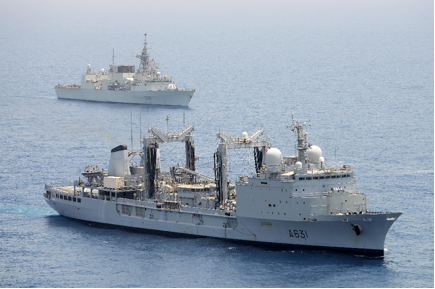 Australian, Canadian, French and Yemeni warships, helicopters and patrol aircraft, Saudi and Djiboutian patrol ships will cooperate all together to this operation. HMCS Toronto before her RAS by FS Somme. The first phase will last two days and will be a planning phase. It will enable the CTF 150 warships to establish interoperability between the different navies and will coordinate the patrol plan of general security. The second phase will enhance the ongoing interoperability and will define the different areas of patrol. It will also enable the CTF 150 forces to establish relationships with the local maritime communities (fishermen, trade sailors and rescue centres). The third phase will conduct coordinated patrol in international waters in order to establish situation awareness in the region. At last, the last phase will execute a plan based on a simulated heightened terrorist threat against free merchant traffic. This will increase readiness of units to detect emerging threats to regular traffic. During this phase, CTF 150 units will conduct friendly approaches and assist visits to engage with local maritime community and build confidence. 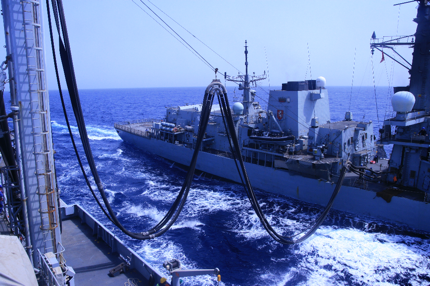 Replenishment at Sea (RAS) by FS SOMME for HMS Kent.